Let me start off by saying how much I dislike this pumpkin spice fad that’s happening. Ever since Starbucks started to offer their “Pumpkin Spice Latte” there has been a craze for pumpkin spice everything. I’ve never been a fan of the artificial flavour and BUT I will say that do like a good homemade pumpkin pie made with real pumpkin and real cinnamon, nutmeg, ginger and allspice. Fall means squash season and an excess of pumpkin puree in stores. I’ve got so much pumpkin puree leftover since thanksgiving and I thought I’d pair one of my favourite herbs with it, Sage. Two fall flavours that go hand in hand and compliment each other so very well. 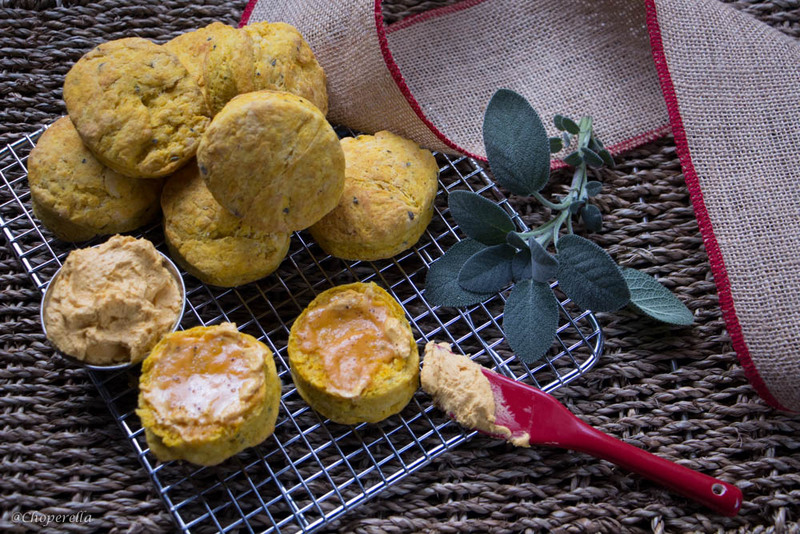 These Pumpkin and Sage biscuits are divine! 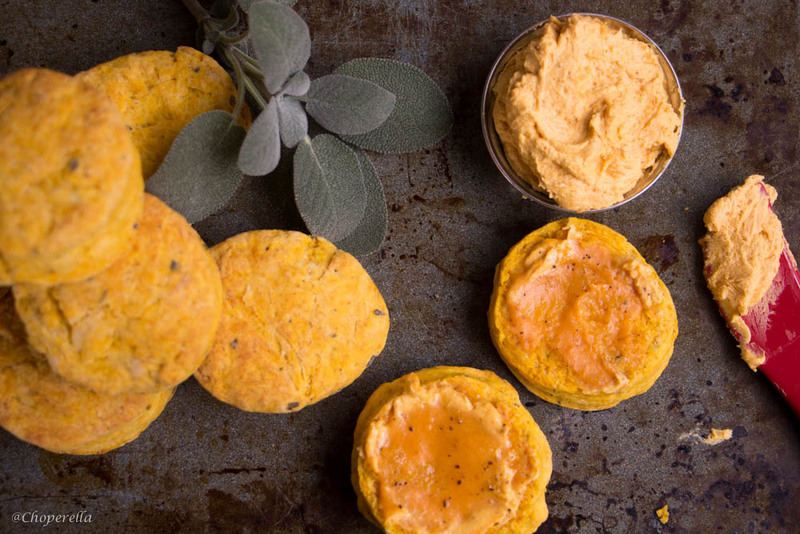 They’re soft, flaky and packed with pumpkin and sage flavour. I even brushed them with sage infused butter prior to baking to add a touch more. 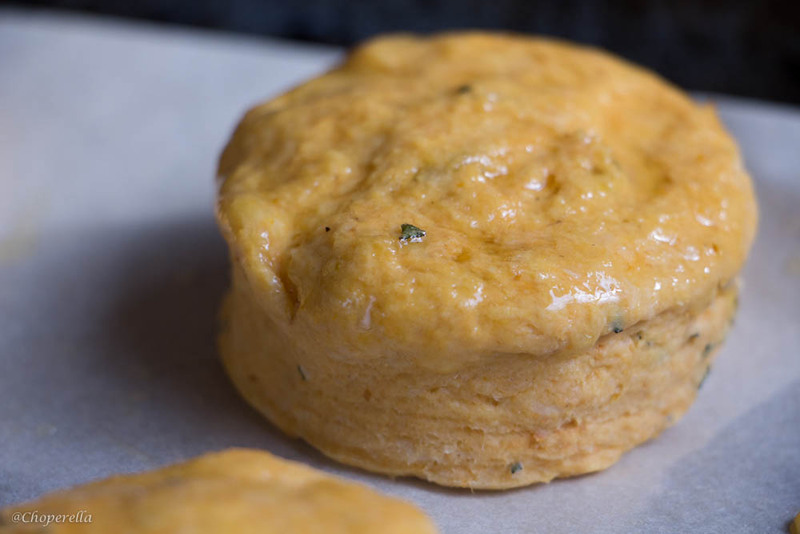 Biscuits are perfect for breakfast on the go, a brunch item or to even make a sandwich. As soon as they came out of the oven, I broke one open and slathered it with a pumpkin and maple whipped butter, which melted beautifully adding another layer of pumpkin. 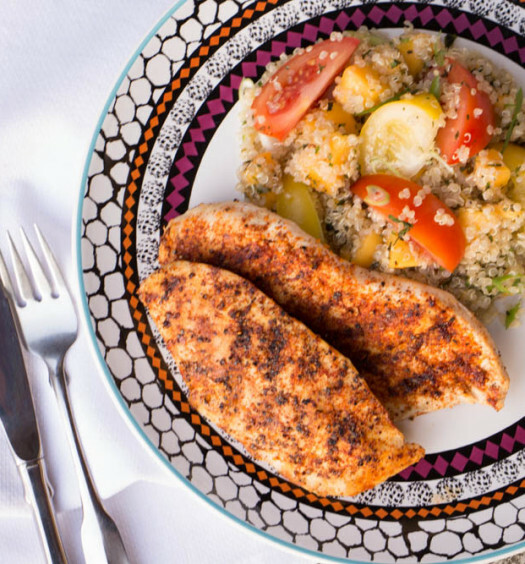 It’s almost necessary to make a second batch because you’ll want to share! I can never be simple with food. Never. I have such fun experimenting and putting my visions to life. 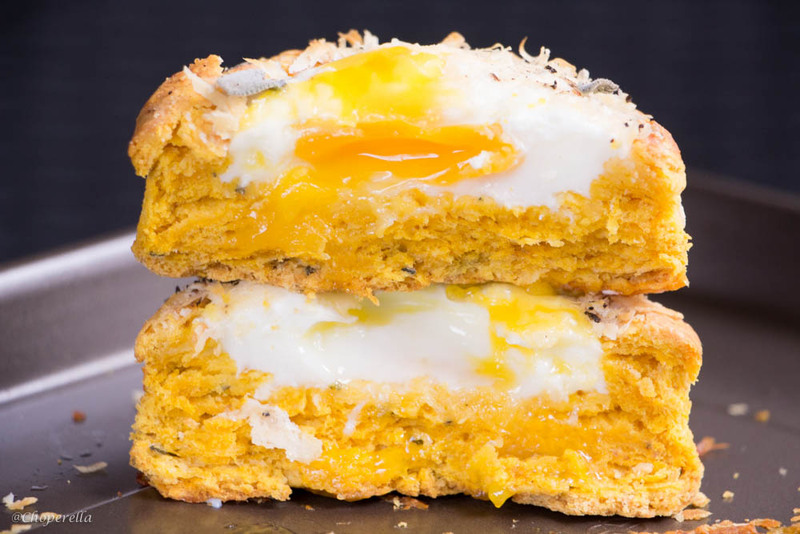 Though the butter was a great topping for the biscuits, I was dying to use the biscuit and make Eggs en Cocotte, but using the scone as the “cocotte”… Eggs en Biscuit Cocotte? I made one large scone (about 5 inches), cut out the center and pressed it down gently. Cracked an egg, sprinkled parmesan cheese (or asiago!) sprinkled some fresh sage and baked it. I sliced it in half and the yolk was just perfectly runny. Ohhhhh my god, took the scones to another level of brunch. Trust me on this and make them. 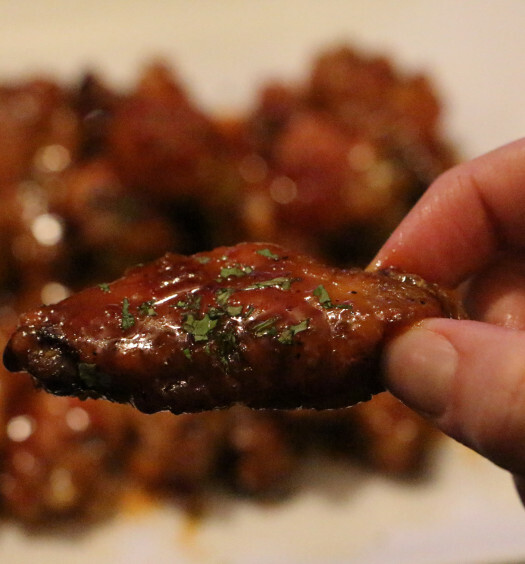 Make them, eat them, share them or gift them. 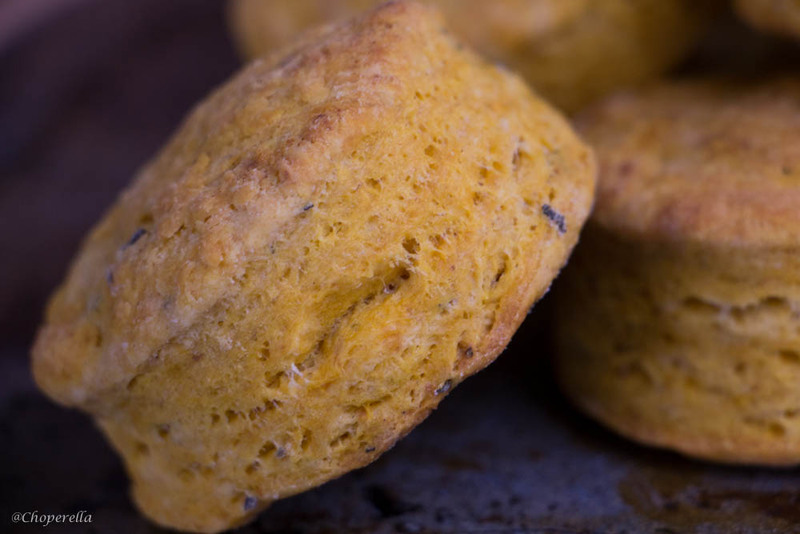 These are a perfect fall biscuit! Pre-heat oven to 400F, line a baking sheet with parchment. In a food processor mix the flour, baking powder, cream of tartar and salt. Add the butter and pulse until it looks like crumbs and put in a large bowl. Put the sage, pumpkin puree, maple syrup and pepper in the bowl. Using a wooden spoon to start, mix the ingredients together folding the pumpkin through. It may seem the dough will not come together, but it will. Switch to your hands and gently knead the dough to combine into a ball. Melt the 2 tablespoons of butter and infuse with the chopped sage. Brush on the tops of the biscuits before baking. Bake for 16 minutes until risen and golden. Serve warm, slathered with Maple Pumpkin butter! Add all ingredients to a bowl and whip on high for 2 minutes until light and fluffy. Cut out the center of a larger biscuit about halfway deep. Press down gently. Crack and egg in the middle, top with cheese, sage and pepper. Bake for 10-12 minutes until egg white is cooked and yolk is runny.